Meiers kicked multiple field goals for the Tigers last fall, including a 40-yarder against Stockton. On Friday, Meiers’ leg helped Natoma earn a 17-12 comeback victory against Sylvan-Lucas. The Tigers ended a four-game losing streak against the Mustangs. 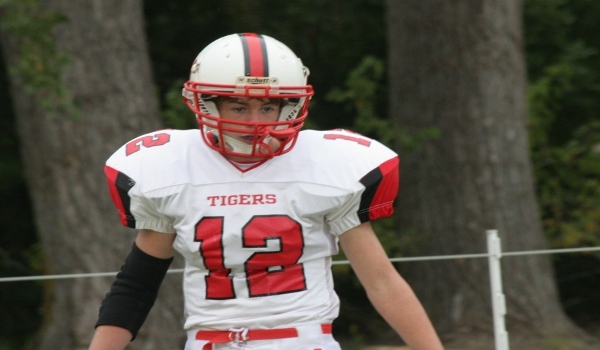 Meiers who has received interest from Auburn, Duke, Harvard and Fort Hays, kicked a first quarter field goal and the Tigers scored two late touchdowns for the win. Meiers was the lone Kansas eight-man player to kick a field goal in Week 1, according to maxpreps.com. Natoma, which has won just seven games in the last three years, could start 4-0 with winnable games against Tescott, Wilson and Stockton the next three weeks. Meiers, who has started in football and basketball since his freshman year and earned two medals in the Class 1A long jump, is a big reason for Natoma’s improvement. He earned all-state kicking honors from multiple publications and has also played well at wide receiver and running back. In the last three games of 2012, Meiers gained more than 400 yards on the ground as Natoma finished 2-1. Meiers grew up in Kansas City and played traveling soccer through the Midwest. His grandparents live in Natoma and Hays and the family decided to move back to tend to the family cattle farm when Meiers entered high school. Few schools in western Kansas have soccer, so Meiers decided to kick. His leg strength comes from genetics and plenty of practice. Meiers has an aunt who is 5-foot-3 and weighs around 90 pounds, but can squat 250-plus pounds. Meiers weighed 120 as a freshman and between 150 and 155 now. He can squat 345 pounds. As a freshman, Meiers delivered a perfect onside kick that Natoma recovered in a 30-22 home loss to Palco. However, his leg was limited to kickoffs. Meiers had a growth spurt between his sophomore and junior year. Then-Natoma coach Fred Winter tried out Meiers’ leg before the 2012 season. Meiers has hit a 55-yard field goal in practice. From then, Meiers has kicked extra points and field goals, an extreme rarity in the eight-man ranks. Smith Center ran their traditional smashmouth offense out of the “Barta bone” last Friday, but also incorporated a pistol formation. The varied looks helped the Redmen collect a 34-13 victory against rival Norton in the opening of the Darren Sasse era. Sasse, the former Redmen junior high coach who took over for Roger Barta, put the pistol in during the summer after he learned it from Roger’s son, Brooks Barta, the longtime successful Holton coach. Sasse said Smith Center fumbled “probably 15,20 times” on the first day of camp before the offense significantly improved. Smith Center recorded total 295 yards, including 142 rushing and four scores on 19 carries from senior Grant Lambert. The Redmen aren’t normally known for passing, but senior quarterback Kody Molzahn finished 2 of 5 for 64 yards. In the first six games of last season, the Redmen finished 7 of 24 for 110 yards. In terms of wins, no other eight-man program in the west has achieved more success since the start of 2009 season than Otis-Bison. The Cougars are 40-7 in that stretch with four straight district titles, at least one playoff victory every year and a state runner-up finish. Otis-Bison, with a young team, opened the year with a 64-44 loss to St. John. Otis-Bison started a freshman at safety, two sophomores and a junior on the defensive line and a senior at outside linebacker making his first start. The offensive line has two sophomores, a freshman that rotates in at tailback, a sophomore at one tight end and a junior making his first start at the other end. Senior quarterback/safety Kole Urban, one of the few returners, played very well. He accounted for six scores, completed 5 of 12 passes for 57 yards with an interception, rushed 25 times for 168 yards and four TDs, collected nine tackles and picked off two passes. “He made some unbelievable plays for us,” Starr said. Meade, the defending Class 2-1A champion, lost 21-20 to Holcomb last Friday, the second straight season the Buffs have taken a one-point loss to the Longhorns. Meade is 1-3 in Week 1 the last three seasons, but 34-1 after that with two state titles. Meade also won state crowns in 1972, ’80 and 2010, but lost a game each season, according to team records. … On the other hand, Class 3A Thomas More Prep-Marian opened with a 24-8 win against Ellinwood. The Monarchs have won five straight season openers, but are 6-26 after Week 1. TMP goes to Clay Center on Friday.